As your pregnancy advances your baby’s skeleton starts to harden, reflecting more of the ultrasound beam and casting black shadows. 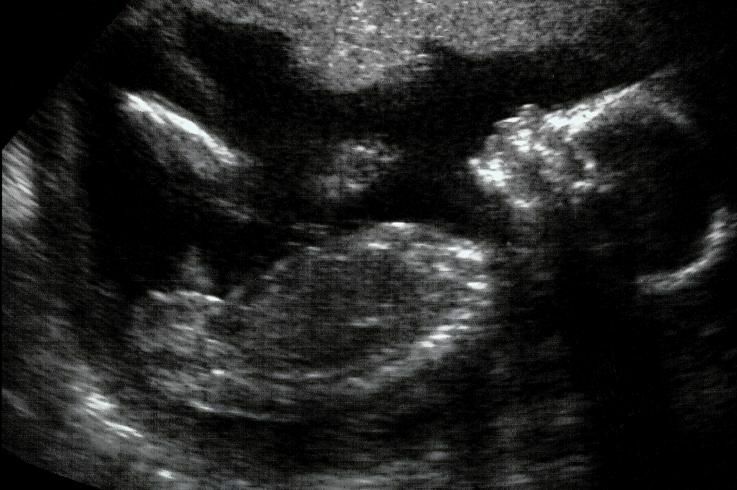 In this scan, the forehead casts a shadow, and it is no longer allowing the brain beneath to be easily seen. Even though you’re well settled into your pregnancy, ensure you maintain all those healthy lifestyle habits you’ve established. You’ve been pregnant for almost six months and are, hopefully, feeling great in yourself. Don’t, however, let this make you complacent. Even though your baby is well developed by this stage, it’s important to maximize her health, and your own, by continuing to eat well and taking care of yourself. Changes, such as not smoking or drinking alcohol, will probably be part of your normal lifestyle now as opposed to something that you have to think about and work hard at. If you have not managed to change your lifestyle to become more healthy, then it is never too late to start. Any changes you make now will benefit both you and your baby. While you’ll need to adapt your exercise routine, if you have one, in these later stages, ensure you continue to be active and, ideally, do something physical every day, even if it’s just a 20-minute stroll. Also keep up your daily pelvic floor exercises – once the baby is born, you’ll be thankful you did. Don’t be afraid to talk to your baby.To begin with, she will recognize lower-pitched sounds, such as deep male voices, more than higher-pitched sounds, like your partner’s voice. This is good for you as it means that there is plenty of time for your baby to get to know your voice before she is born. After birth, your baby will recognize your voice and this will have a calming effect when she is distressed. So tell her about your day and even read to her – it all helps to create a bond. A correctly worn seat belt reduces the risk of injury to the unborn baby by 70 per cent. In recent research, over half of pregnant women did not wear their seat belt correctly, positioning it too high across the abdomen and putting the torso strap behind them rather than over the shoulder. It may feel cumbersome to wear a seat belt while you’re pregnant, but it is essential, and a legal requirement. The good news is it’s possible to buckle up comfortably. Fasten the belt over your shoulder, as normal, and between your breasts. Position the lower part of the belt below your bump, and flat over your hips. If an emergency stop is necessary, be reassured that your baby is very safely cushioned by the amniotic fluid that surrounds her and your strong uterine muscles. For maximum safety and comfort, wear the seat belt positioned between your breasts and under your bump.